Iris Apfel appears more energetic, engaged and intensely curious at 93 than most of us can manage at 23, and a clearly smitten Albert Maysles emphasizes that indomitable spirit in his irresistible portrait of the geriatric fashion icon. Direct Cinema pioneer Maysles, a hugely influential figure in documentary film, was in his late eighties when shooting Iris -- he died on March 5 -- and he clearly recognized himself in his subject: Having blazed impressive trails, both continued to light out for new territory instead of settling in comfortably at the homestead during their senescence. However, as someone who regards fashion with a skepticism bordering on contempt, I confess that Apfel's accomplishments are harder to quantify than those of Maysles, whose films include such seminal documentaries as Salesman, Grey Gardens and Gimme Shelter. After first establishing a successful interior-design business, Apfel founded (with her long-time husband, Carl) Old World Weavers, a manufacturer of artisanal fabrics that helped restore textiles in major museum collections and the White House. This substantial career, which began in a post-war, pre-feminist era unwelcoming to women entrepreneurs, undeniably merits admiration, but Apfel's latter-day celebrity more problematically derives from her style. 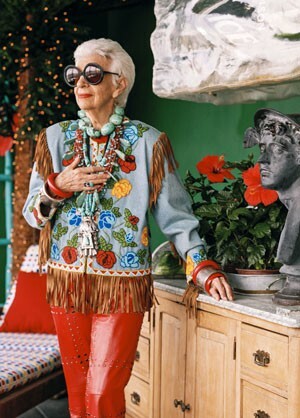 Iris Apfel shines in Maysles' final picture. An inveterate collector -- her homes are chock-a-block with objects and art, and a vast storage space barely contains the overflow -- Apfel accumulated immense quantities of wearable items on her frequent travels. Although her endless racks contain an abundance of haute couture, Apfel was as attracted to the open-air bazaar as the runway show, and she whimsically mixes and matches designer clothes, repurposed fabrics, flea-market bargains, indigenous garments, saucer-size eyeglasses and dense layers of costume jewelry to achieve her signature look: eccentric and eye-poppingly vivid. Apfel dressed in this highly individualized way throughout her life, but it wasn't until 2005, when the Metropolitan Museum of Art's Costume Institute mounted a show featuring a tiny sliver of her collection, Rara Avis (Rare Bird): The Irreverent Iris Apfel, that she entered the fashion world's consciousness and a star was belatedly born. Maysles marshals an array of experts -- from photographer Bruce Weber to Met curator Harold Koda to Paper's editorial director Mickey Boardman -- to build the case for Apfel's status as an artist whose media are clothes and jewelry, with her own body serving as canvas. Although the uniqueness of her vision is certainly clear, my own purely utilitarian view of fashion -- I dress for comfort, not to project my personality -- makes it difficult for me to accept Apfel as a creator on par with a painter or sculptor. Fortunately, Iris doesn't require us to share that perspective: Her undimmed wit, intelligence and personality are more than sufficient to hold our interest and earn our admiration. Even without her colorful plumage, Apfel would remain a truly rare bird, and Iris provides a privileged glimpse of her native habitat. Directed by Albert Maysles. Starring Carl and Iris Apfel. 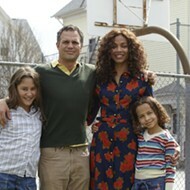 Opens Friday, May 22, at Plaza Frontenac Cinema.